"If you've ever been to the Bahamas you'll love this dish.... It takes you back there. It's EASY, filling, well balanced, and good for a larger family or small gathering." Preheat oven to 375 degrees F (190 degrees C). Lightly grease a medium glass baking dish. Place the chicken breasts in the prepared baking dish, and season with paprika, seasoned salt, and pepper. 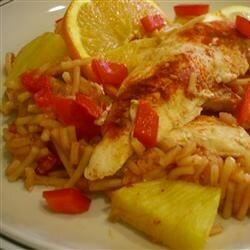 Arrange the pineapple, orange, lemon, and red bell pepper around the chicken, reserving a few slices of each for serving. Bake chicken uncovered 20 minutes in the preheated oven. Turn, season again with paprika, seasoned salt, and pepper, and continue baking 10 minutes, or until chicken juices run clear. While chicken is baking, prepare the Spanish rice according to package directions and heat the undiluted black bean soup in a pot over medium heat. Serve each chicken breast and some of the cooked fruit and red bell pepper over equal portions of the Spanish rice, and topped with a few spoonfuls black bean soup. Arrange the reserved uncooked fruit and pepper slices around the rice. Very good. Boyfriend said it tasted like restaurant quality! Added red pepper, cloves, nutmeg, and cinnamon. A++ This recipe is wonderful "as is" but I like to add a little chili powder and cayenne pepper to spice it up. It gives it a great sweet and spicy kick thats just right! Pretty good, and different flavors than the everyday.